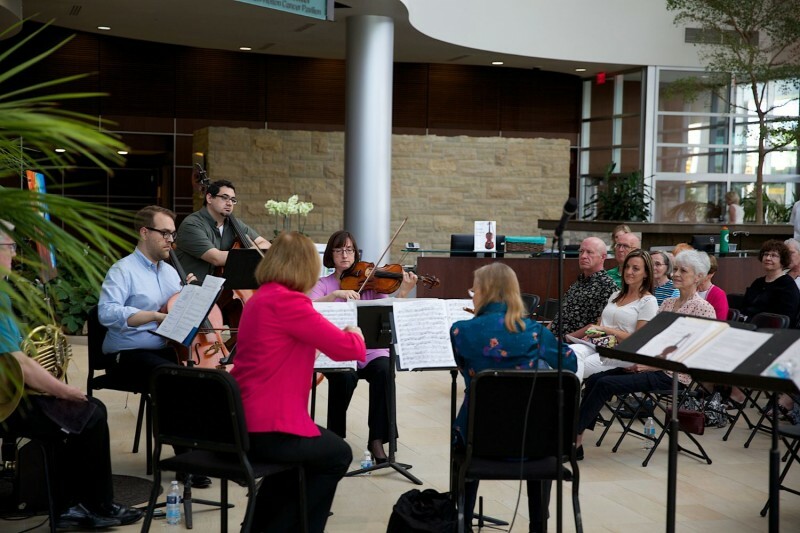 Grand Rapids Symphony’s Music for Health was launched in 2013 in collaboration with Spectrum Health’s music therapy program. 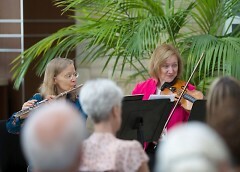 Musicians, in pairs, perform monthly in group sessions at Spectrum Neuro-Rehabilitation and Nursing Center for patients undergoing rehabilitation, such as after an accident. During each service, musicians collaborate with a designated “gatekeeper” from the health care facility who knows the patients and helps tailor the activities to the patients’ needs. With musicians playing live, caregivers can ask for changes in volume or tempo on the spot in response to a patient’s abilities or progress. “It’s one thing to go to physical therapy and make this motion 25 times. But if we can get music going, they might not even notice they’ve done it 25 times,” said Diane McElfish Helle, who is program administrator for the Music for Health Initiative. Hospitals are places were most people would rather not be. More than 10 years ago, Grand Rapids Symphony’s Diane McElfish Helle found herself visiting her father in a neuro-intensive care unit in Pittsburgh. “In an ICU, anxiety, fear and boredom are part of each day,” McElfish Helle said. Hoping to cheer her father up, the Grand Rapids Symphony musician brought along her violin to play for her father. Diane McElfish Helle soon realized she was playing for many more people. As soon as she started playing, nurses opened the glass door so they could hear the music, too. It wasn’t long before others from all across the hospital floor asked if she would come and play for their loved ones, too. “Music brought an unexpected touch of beauty and peacefulness and meaning to their lives,” McElfish Helle realized. That experience led McElfish Helle and the Grand Rapids Symphony to launch its Music for Health Initiative, a program to send symphony musicians into area hospitals, armed with the healing power of music. 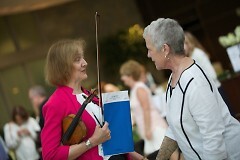 On Wednesday, June 7, the League of American Orchestras will honor McElfish Helle with its prestigious Ford Musician Award for Excellence in Community Service. The Pittsburgh native, a member of the Grand Rapids Symphony for 37 years, is one of five professional musicians being honored at the League’s 72nd annual National Conference, which happens to be in Detroit this year. The awards funded by the Ford Motor Company Fund include a $2,500 grant to each musician plus an additional $2,500 grant to the musician’s orchestra to support professional development focused on community service and engagement. 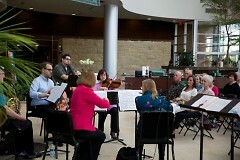 Grand Rapids Symphony’s Music for Health Initiative is a program that sends symphony musicians into area hospitals to assist with patient rehabilitation as well as to create supportive physical, emotional and spiritual experiences for patients as well as for the friends, families and providers who care for them. The groundwork for Music for Health was launched in 2012 when McElfish Helle met with a music therapist and the program director Spectrum Health Neuro-Rehab to explore how the Grand Rapids Symphony might contribute to their work with patients recovering from traumatic brain injury. Grand Rapids Symphony’s partnership with Spectrum Health has pairs of musicians playing group music therapy sessions every month, sessions designed around patient needs whether they are physical, emotional or mental. The Getty Grant provided funds to adapt music or commission new music for use in Music for Health therapy sessions. Grand Rapids Symphony’s Assistant Principal Cellist Jeremy Crosmer, who also is part of the Music for Health team, was the composer.